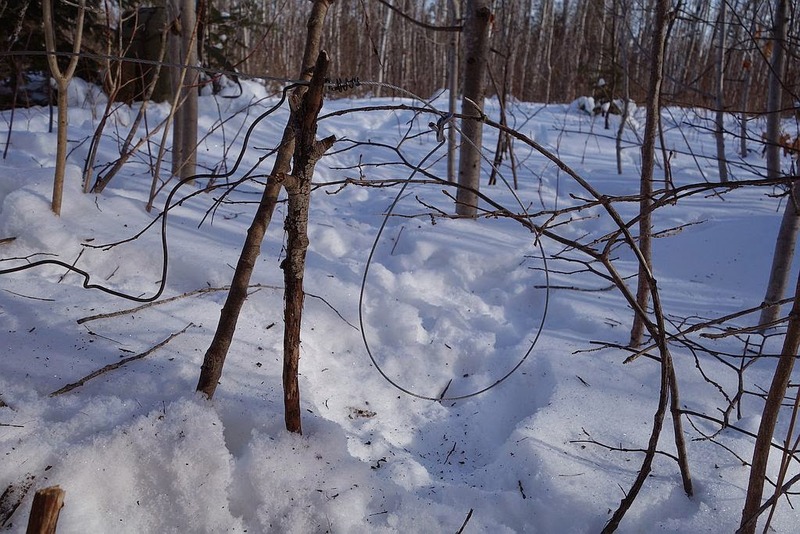 I had some messages with questions regarding how I choose where to set my snares, what type of snares I'm using and some other general questions about snaring so I thought I'd do a post specific to it. There is a wealth of information on the web regarding snaring for rabbits and hares, much of it is worthwhile reading/watching for the aspiring snare-person. 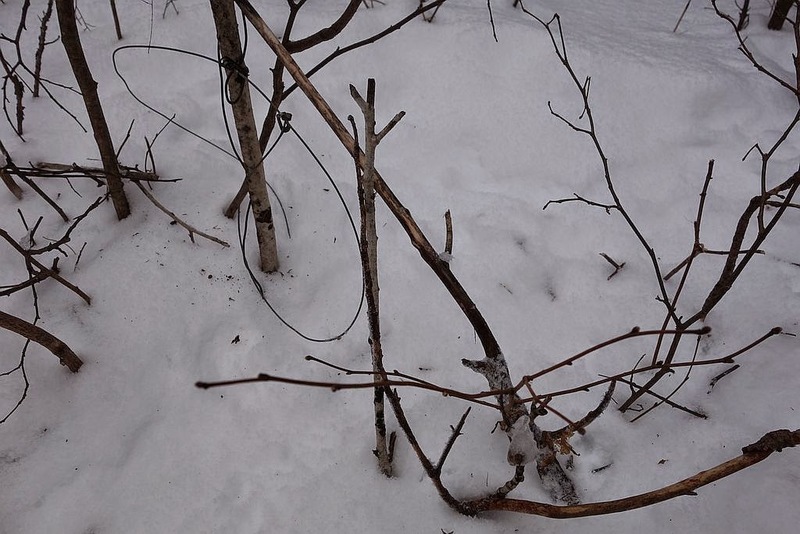 You'll need to check your local state or provincial law, snaring is not legal in all locations. 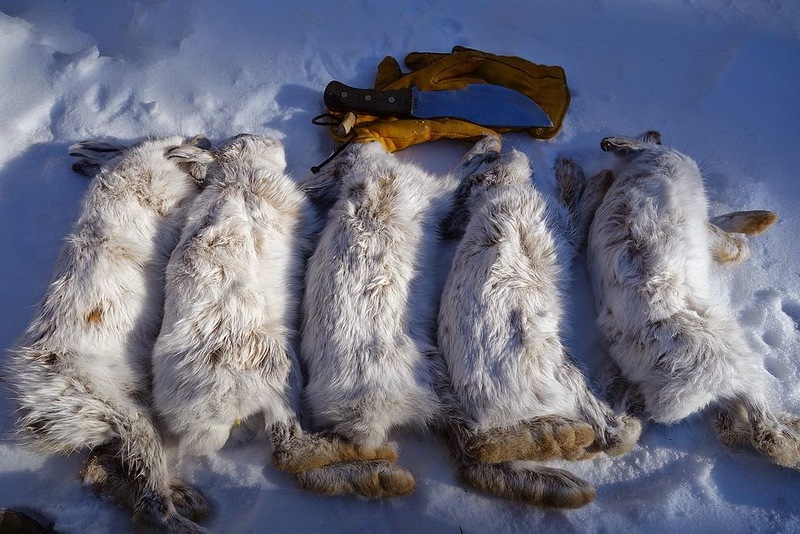 Snowshoe hare or Varying Hare are my only quarry, though I imagine the process for snaring rabbits of other varieties is similar. I'm not claiming to be an expert, far from it, what works for me I figured out, over time and trial, it may not necessarily work as well for others in different circumstances and conditions. 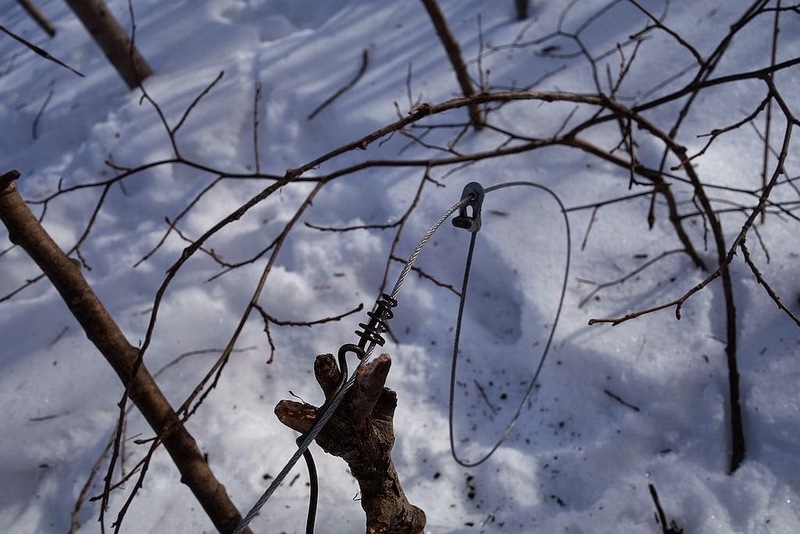 I don't feel that it's necessary to get long winded on defining and describing a snare, if you're interested and a reader of this blog you probably already know what they are and what they consist of however, if one was looking for more detailed information you'll find it on this page; Basics of Snaring. I'm familiar with snare wire, brass and otherwise, and while I've seen plenty of hares taken with it I prefer to use cable snares. Specifically a 30" piece of 3/64" 7x7 cable, lowpro locks, screw on support collars and an 11 gauge swivel. There are a couple reasons for that. While brass wire is lighter in weight and perhaps more economical in the short term, I don't believe it survives as well as cable. I believe cable snares work better than brass wire, they are more reliable in all aspects and so prefer them over wire. 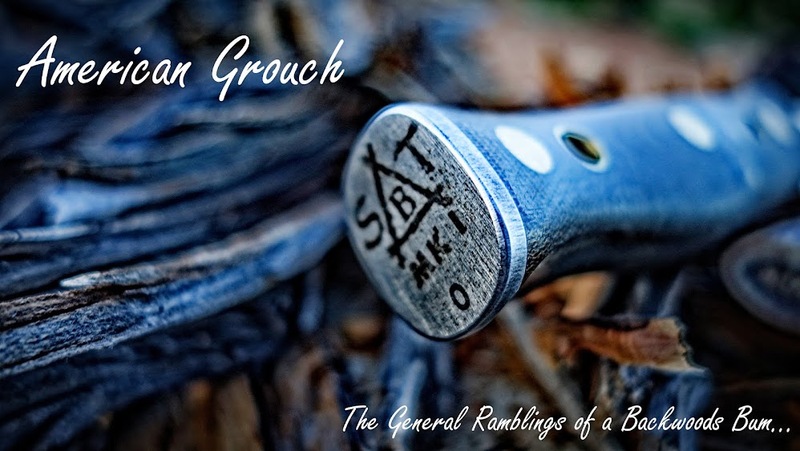 If you're going to take the time to actually place multiple snares and run the line every day then you might as well set yourself up for success and use quality snares. 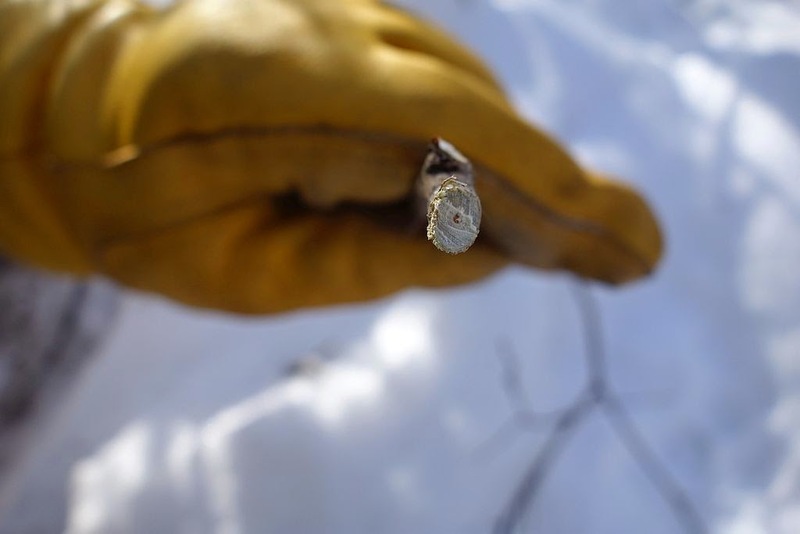 While I make my own snares these days, it is quite economical to purchase a dozen or more snares and there are several online resources for them, two that I would recommend are The Snare Shop and Dakota Line Snares. Along with the snares I carry a Leatherman Wave Multi-tool to cut 11 and 14 gauge wire. I use this wire to 'anchor' the snares to trees and to position the snare via the collar, I'll explain that along with some images later. So really, all that is physically needed are the snares, some wire, and something to cut the wire with. That and an understanding of where to set them for the highest probability of success. Lepus americanus, Snowshoe hares are primarily found in boreal forests and upper mountain forests. 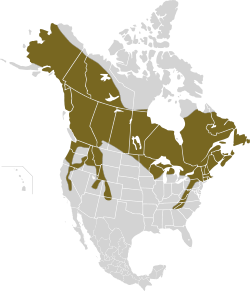 Their range for North America can be seen below. In my area I can find them both in the lowland bogs and highlands where there are conifer thickets. 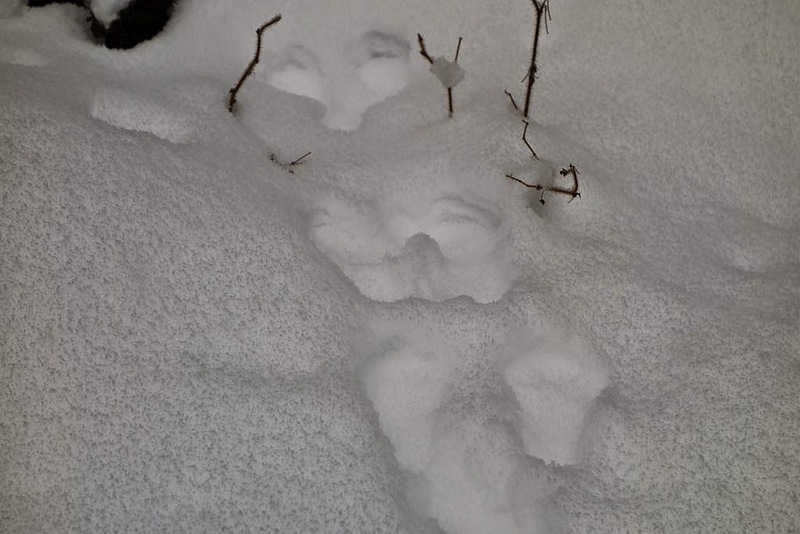 Since I have snow for roughly five months a year I can easily follow their trails and get familiar with their habitat. 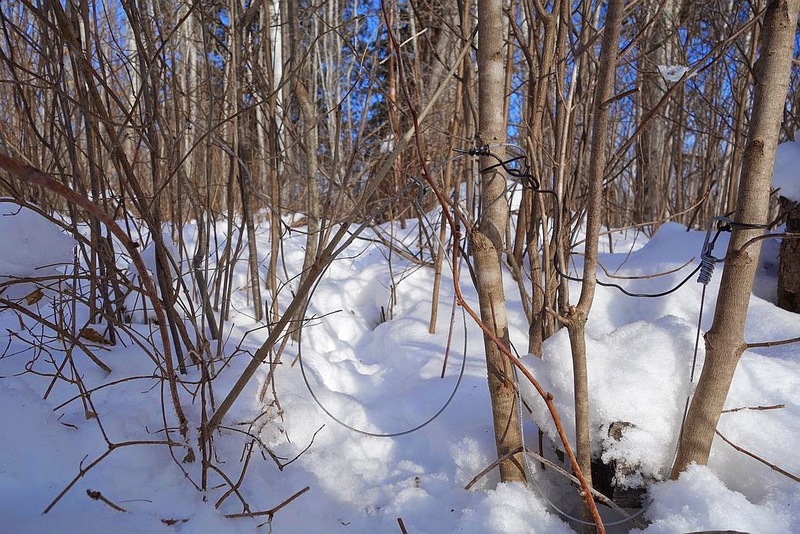 In the spring after snow melt you can visibly see how deep the snow was because you'll find 'chew lines' on the understory where hares had eaten the bark off of some shrubs and saplings. The summer after our worst winter I can remember I could look at the chew lines without stooping or looking down, they were eye level in some places. 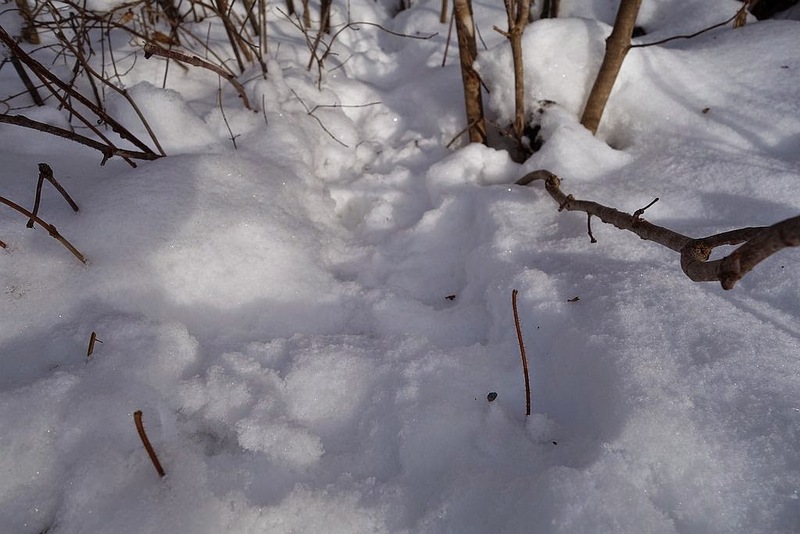 Looking at all the hare tracks in the snow you'll get the impression they run everywhere but while they'll break out on new paths more often than not they use the same paths, the path of least resistance with the most abundant cover and browse available. 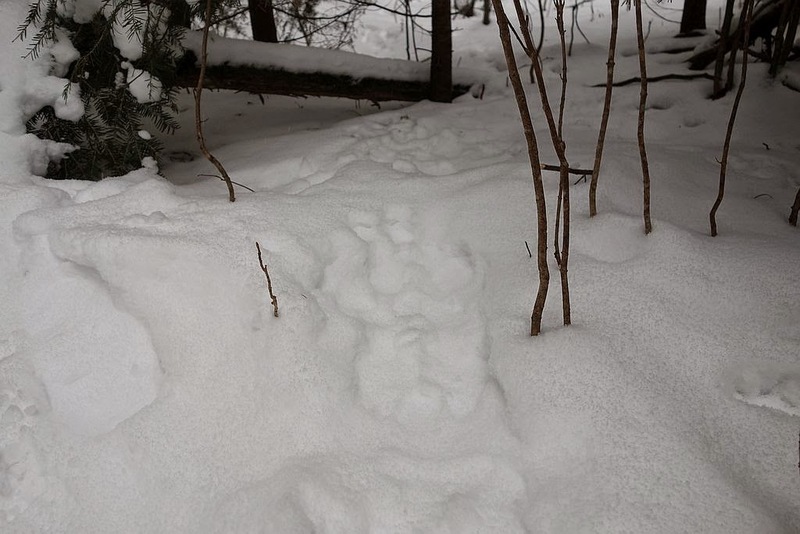 In the image below you'll see hare tracks but note that they are one direction, this is what I call an 'exploratory' path, the hare traveled this way but did not return on the same path. 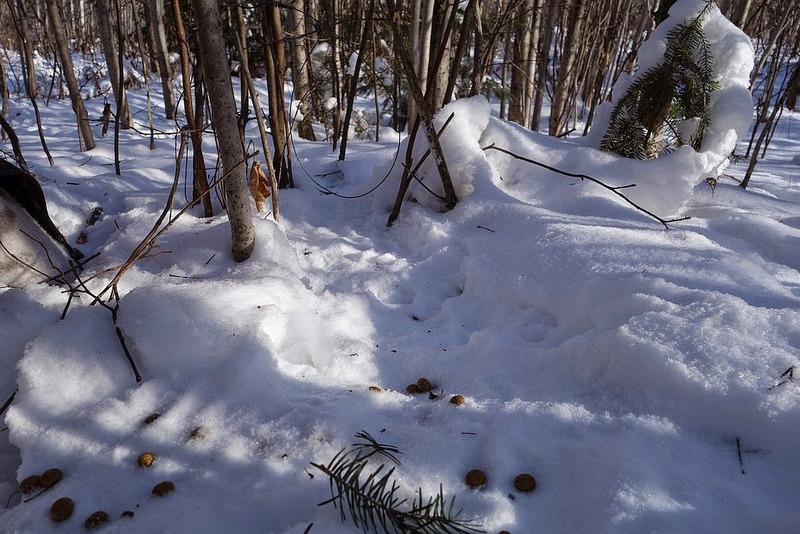 If you were to look around this area and track that hare you'll find that single set of tracks eventually joins up on an actual hare run, which is what you see in the second image. And an even better, more used run. You'll find where they've neatly snipped off limbs, chewed bark, nipped needles and so on. 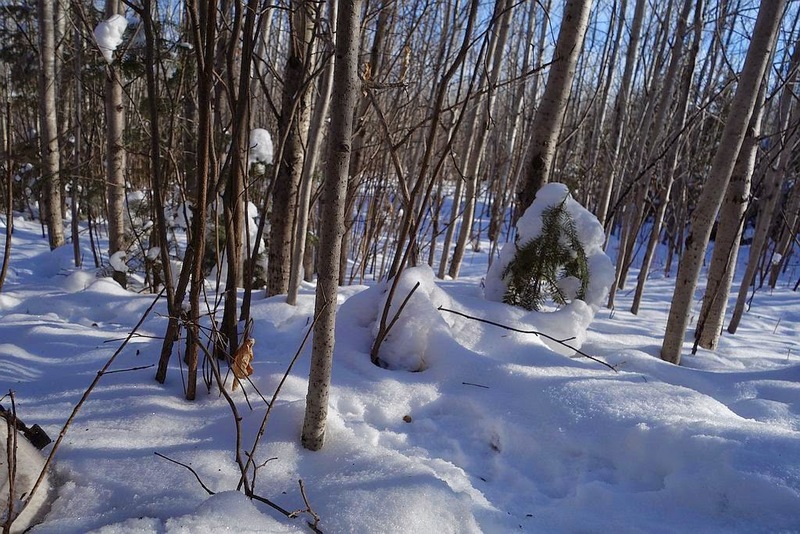 They prefer to run the same trails and often run through 'tunnels' of brush and understory for the safety of the cover. 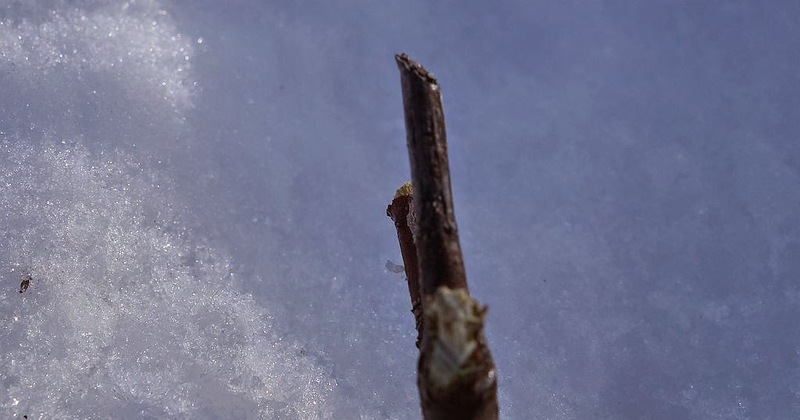 They'll run through 'holes' in the brush that are large enough for them but not large enough to permit fox or coyote and the like to pass through. These 'choke' points are perfect places to set snares. In the image below you can see the hare run, it is even more visible in the second image and if you look close you'll see the snare set within that run between the brush. Below you can clearly see the snare. Because of their behavior it is relatively simple to set snares, 'set on sign' as the saying goes, and in the funnels of their own creation. This will put them in your snares. 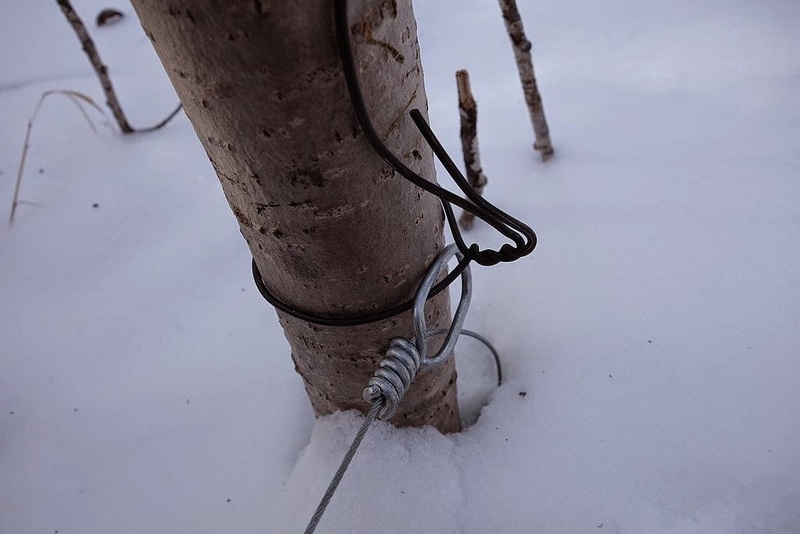 I use 11 and 14 gauge wire to anchor my snares to trees and saplings, simply twist the wire with the snare swivel inside, around the tree as seen below. 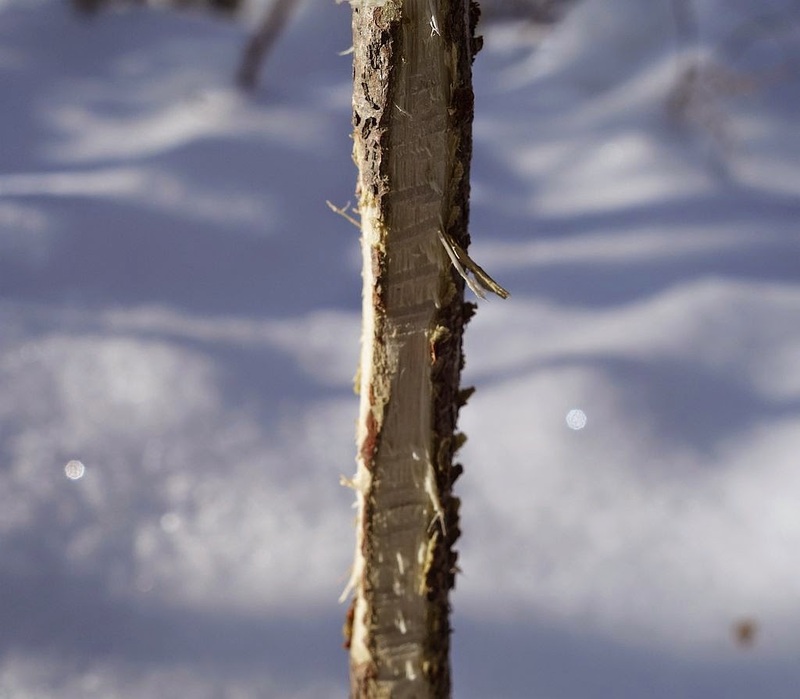 Once twisted up make sure the tag end is folded out of the way or pressed down under the snowline. I do this to prevent the hare from impaling on the tag or tearing themselves apart on it. I do save the pelts and tan them, making drawstring bags, mitten inserts, wrist warmers and so on, so I try to make sure their pelts are not damaged in the process. Using the other end of the wire, pressed into the snare collar it holds the snare in the position and the height that I want it. 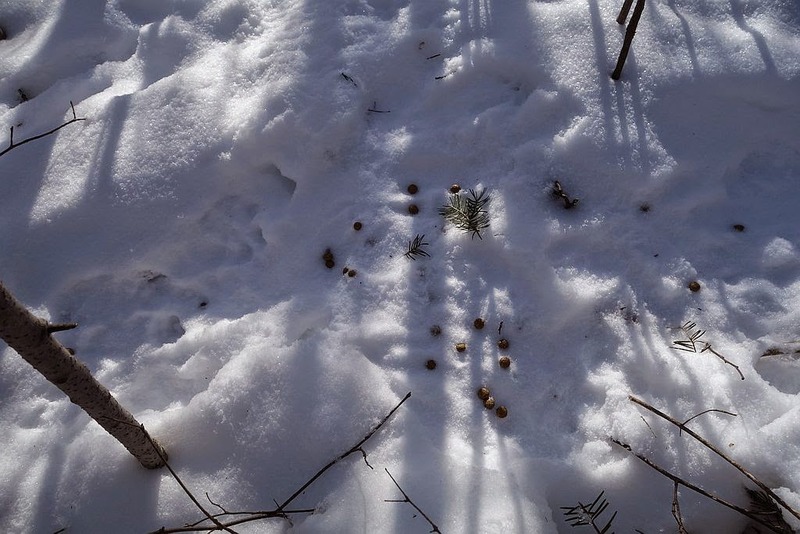 As a side note, one of the other benefits of tracking and snaring hares is their droppings. Crazy right? Well I've found that it makes the best filler/binding agent I have found for making pine pitch. 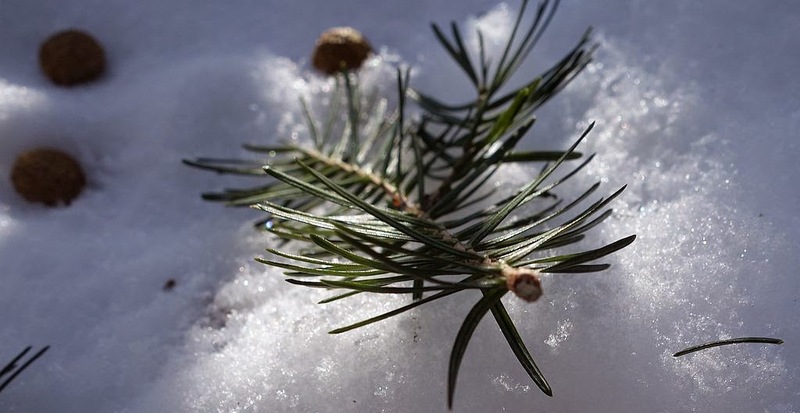 Incidentally you can find an excellent Pine Pitch Tutorial here and here. Use good quality snares, good components, anchor them securely. 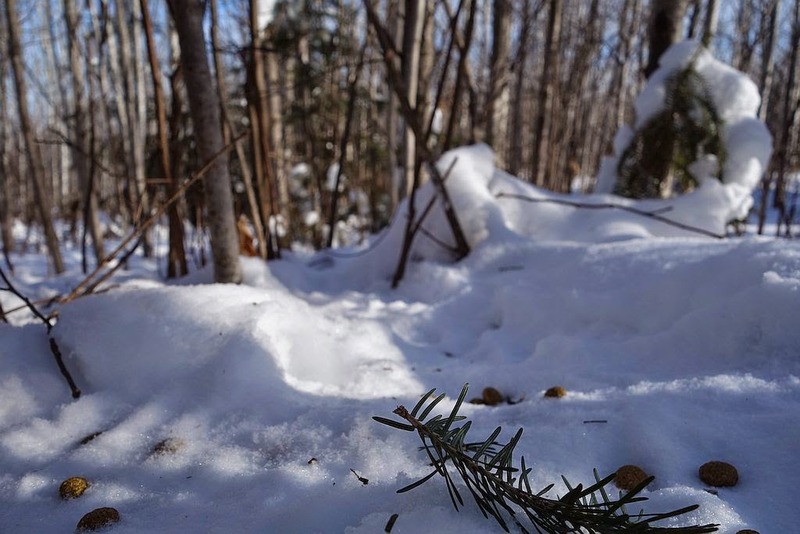 Set on heavily used trails, look beyond the trail and see if it intersects with another, set where the two trails merge. 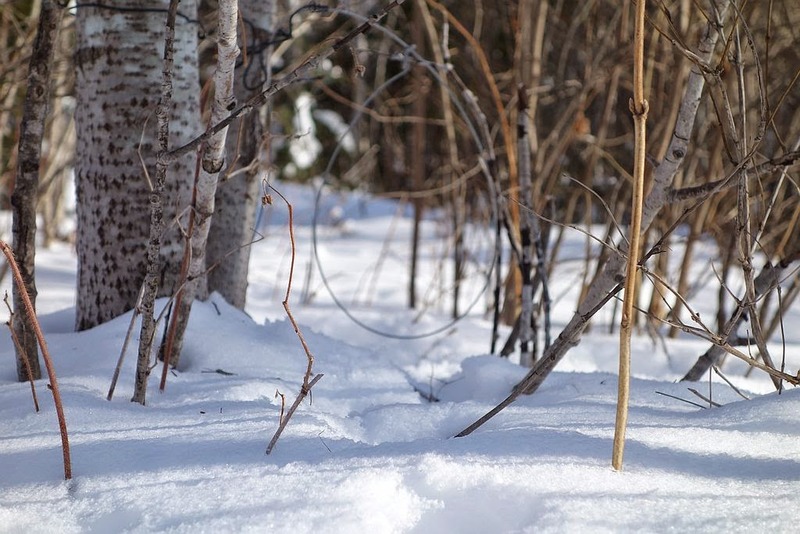 Use sticks to fence and direct them into the snare. Be diligent, check the line every day, make sure the sets are good even if empty, a miss will tell you why it was a miss, learn from it and set again. Sometimes a miss is worth more than a catch if you learn from it. Try to set with overhead cover, raptors will rob you if they spot a hare in the snare. 1/4 to 1/2 pound of bacon chopped into small pieces, brown both together. 4 redskin potatoes sliced thin. 4 or 5 celery sticks chopped. 3/4 of a sweet onion sliced/diced. Sliced mushrooms, leave out if you don't like them. Season with your favorite seasons, I mostly just use a lot of pepper. Once you've got that in the pot, pour the browned hare and bacon, grease and all into the lot and stir it up pretty good. 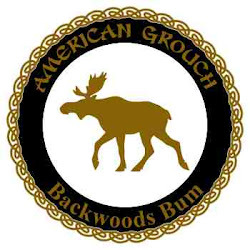 Put the crock on high and go huntin' or something, eat 5 or 6 hours later. My wife is somewhat finicky on wild hare/rabbit but even she likes it like this. For those who were interested, hope this helps! Great overview. We seem to be in the midst of a nadir in the snowshoe population here in NW MT, which is too bad given how tasty they are.